Many artists are most rigid in the way that they work. Following a consistent path to the production of a painting feels secure to these people. I, however, vary greatly in the way that I develop a painting. This piece was produced half in my car on site, with the balance executed in my studio. This mixed-media piece involved India ink on matboard administered by fountain brush and penthe in car bitand then tinted with acrylic later on. 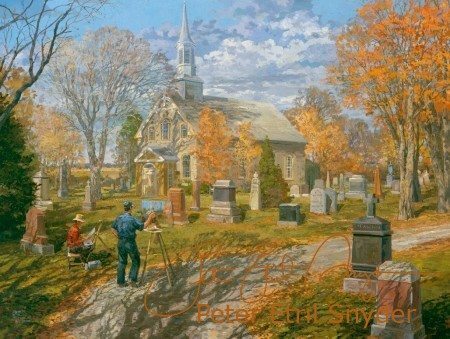 Have you ever wondered why you so seldom find artists painting out in the countryside or on city streets? 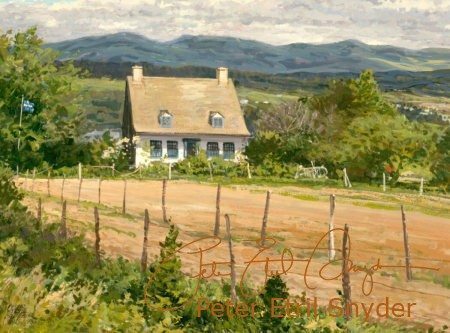 That activity called plein aire painting is quite demanding, not only because of the vagaries of the weather and the hassles with transporting equipment but also because of the difficulty restricting a view. Where should the edge of the painting be? What should be included? What should be the focal point, the heart of that work? Now add another factor to those questions. How much can I produce in an hour? On a recent edition of the CBS program, Sunday Morning, a segment was presented that examined all types of dwellings. That show originated from Jefferson’s self-styled, eccentric, mountain-top house, Monticello. 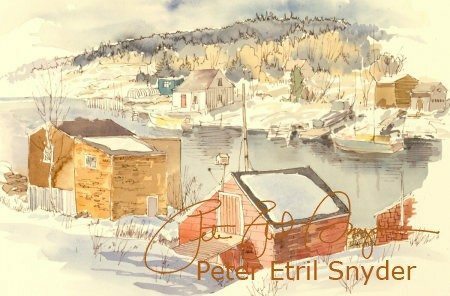 It started me thinking about the many homes that I have painted over the years in various countries. I have not tackled Monticello, but I have visited that much promoted residence. I would be one of the few people who are not very enthusiastic about that self-designed Italianate villa. 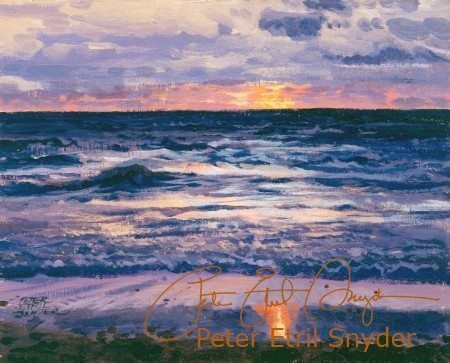 Over the last forty years I have had the opportunity to paint by the sea in many locations. It is perhaps rather puzzling to think about why I, who come from landlocked Waterloo Region, would be so drawn to the many colours of the ocean. 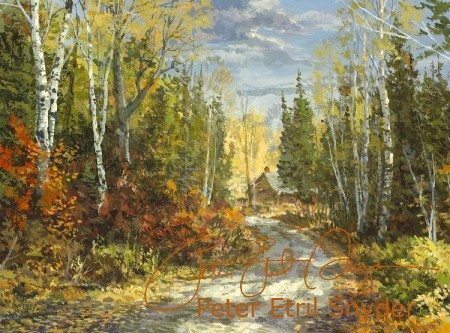 This painting shows the vestiges of the old style cabin that I discovered near McKellar, Ontario. To be sure, this building is well past its “Best By” date. I noticed a real estate advertisement recently that proclaimed the virtues of “cottage” sites in this very area, so I guess if this log cabin is still standing, it won’t be for long. I have often thought that painters who set up their easels where the public can watch and comment are either exhibitionists or masochists, possibly both. It is also a way for an artist to draw a crowd of potential customers. Yes, guilty as charged, I have stood toe to toe with scenery in many areas of the world. In most cases, I would like to think that I’ve had a few victories, a number of draws, and certainly my share of defeats. But just as in boxing, a split decision is a possible result. My travel sketches are most often about a particular destination that I have visited. Sometimes I go to great lengths to bring my viewer to spots which are from time to time unusual, out of the way, and personal. A particular physical feature may spur my desire to paint. 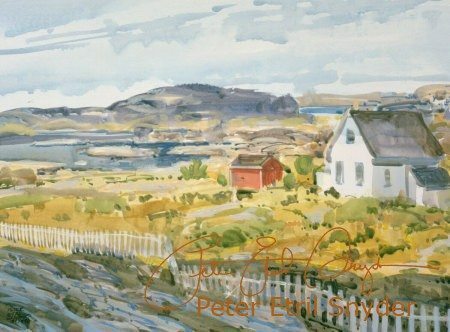 Peggy’s Cove with its signature lighthouse or grain elevators in Saskatchewan bring a focal point to a work. 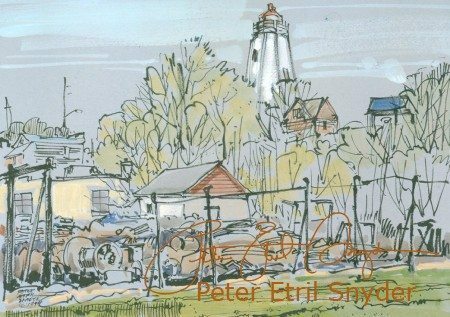 At times, the design of an object such as Big Ben or Talliessen, Frank Lloyd Wright’s summer studio, features in my sketches. From the time that I was a teenager and attended classes at M.F. Kousal’s studio, I have been attracted to landscape painting. Since those lessons forty years ago, I have painted landscape from many corners of the world. Often the scene was merely a background, while animal or human activity was the main focus. 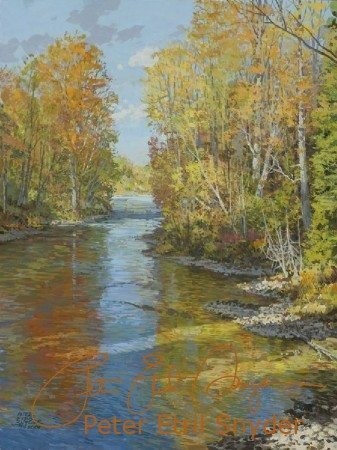 This painting shows the West Credit River near Belfountain, Ontario. Stone from a nearby quarry was used for the construction of the Ontario Parliament Buildings. 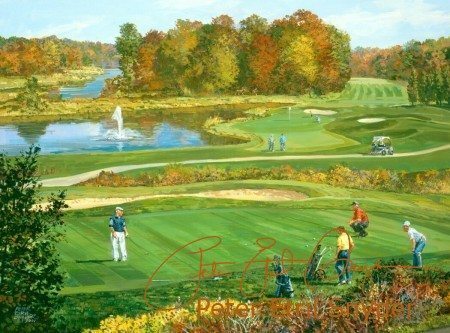 Grateful club members commissioned this fall-version painting of their Club adjacent to the Grand River, in celebration of the 10th Anniversary of those links made possible by the efforts of the principal shown on the green. Here beside the river on a perfect autumn day, it is hard to believe that there could exist a more wonderful world. I am not a golfer, something to do with co-ordination I think, but I would readily admit that some of the most attractive landscapes cradle this Scottish sport. Strange that these tranquil settings give rise to so much trauma and frustration.